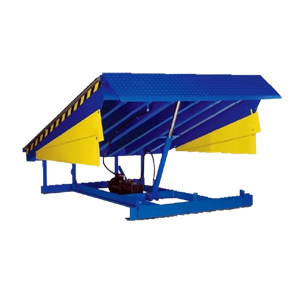 AAK Hydraulic Dock Levelers are designed to handle the fast pace of busy loading docks, with unique design features and hydraulics, these dock levelers are built to last. Making Loading , Unloading Convenient & Easier. Strong Robust & Sleek Design. The welding quality and painting quality make it stand out from traditional stackers. Easy operate with less effort. Built in charger option is also available. Power travel with compact and stable structure. Low maintenance and good operational visibility. Hydraulic Dock Leveler serves as a bridge between a loading dock _oor and the load bed of a transport vehicle. The leveler’s upper deck plate, complete with a hinged, vertically hanging lip, is in a shallow pit at the edge of the dock, _ush with the dock’s edge and the _oor surface. It is hydraulically operated via the Blue GeniusÔ Control Station. After the door has been opened, the rear of a transport vehicle is parked and restrained in place against the outer wall of the loading dock, in working alignment with the dock leveler. The leveler is then operated by maintaining pressure on a touch button to raise the front of the deck. The hinged lip plate raises with the deck, its leading edge swinging out horizontally over the rear of the transporter vehicle once the deck reaches its fully raised position. The dock attendant releases the push button, causing the deck and extended lip to lower together until the lip’s underside comes to rest on the load bed of the transporter vehicle. A solid bridge is now formed between the dock and the truck. During loading/unloading operations, both deck and lip automatically follow the raising and lowering movement of the transporter vehicle. Once all work is completed, the dock attendant returns the leveler to its original stored position.